The subway is generally more useful than city buses, but there are exceptions. As a short-term visitor to see the sights in Boston, you'll find yourself walking or taking taxis, the subway or Commuter Rail trains to most of the places you want to go. Buses are less useful than rail transport for the major sights. Silver Line buses are particularly handy for connecting Boston-Logan International Airport with South Station Transportation Center, and downtown Boston with the Seaport District. 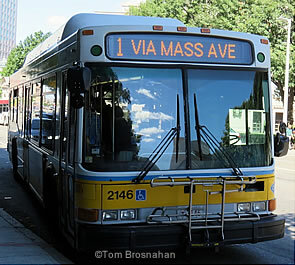 For route maps, schedules, and information, see the MBTA website. MBTA Bus 1 from Harvard Square, Cambridge.